Because I'm a glutton for punishment, I recently started rolling out System Center Configuration Manager 2012 R2 SP1 and System Center Endpoint Protection across our VDI environment. There are always some considerations to be made in a pooled desktop / gold image type environment when loading software that uniquely identifies devices, but lucky for me SCCM/SCEP handled this just fine without any tweaking. However, there were some nuances to how SCEP policies are applied that caused some serious hair-pulling before I spotted the issues. Default policies will apply if you have not created any custom policies. 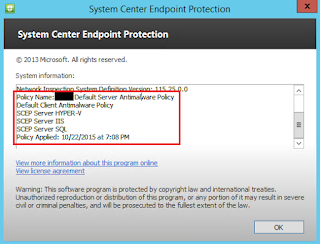 Custom policies are created under Assets and Compliance > Endpoint Protection > Antimalware Policies. Custom policy settings will always override default policies (unless you have one of the issues described in the next sections). Policies must be applied to a collection containing the device(s) you want to apply it to before they do anything. In SCCM 2012 R2 SP1, policies are now cumulative and will do an automatic "client side merge" by default, obeying the order of precedence you specify in the Antimalware Policies section. This also means if two different policies apply to a workstation based on collection membership and each policy has unique exclusions, all exclusions will be added to the client. In previous versions of SCCM, this was not the case (only one policy was applied to each client and a manual server-side merge was required to combine multiple policies). Refresh machine/computer policy from the client to force it to process new policy changes. For faster policy adjustments, Adjust the Client policy polling interval in the applied Client Settings to increase the refresh interval. If you aren't seeing policies here, then there is a problem between SCEP and SCCM. Your client is unaware, either due to an error or misconfiguration, that it should even try to apply any policies. In SCCM, select the device from the Assets and Compliance screen and move to the Antimalware Policies tab. Check the Policy Application State - it should show your policies there and they should show "Succeeded" with a recent update date/time. 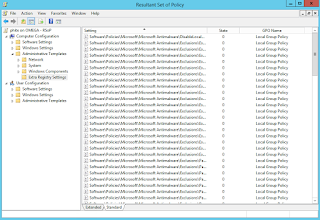 If the policy isn't there, then you probably didn't deploy it correctly in SCCM. If the policy appears, but doesn't show anything for the application state, then the client hasn't yet received it. Force the device to update machine policy and wait a few minutes. Check the CcmExec.log and EndpointProtectionAgent.log files under c:\windows\CCM\Logs for errors. If you some of your custom policies are applying, but not the ones you expect, check and ensure that they are applying in the correct order. 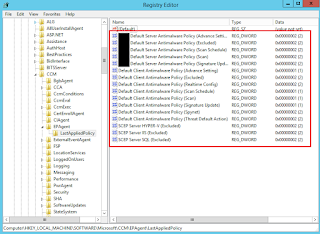 You can check which policies are being obeyed by querying the following registry key: HKEY_LOCAL_MACHINE\SOFTWARE\Microsoft\CCM\EPAgent\LastAppliedPolicy. Policies listed there with higher values take precedence over settings with lower values, as I understand it. "Exclusion" policies will have the same value usually, indicating they will be merged together. If you find that the policies are appearing the SCEP client correctly under "About", but you aren't actually getting the exclusions and settings you expect, the issue might be with local GPO processing. 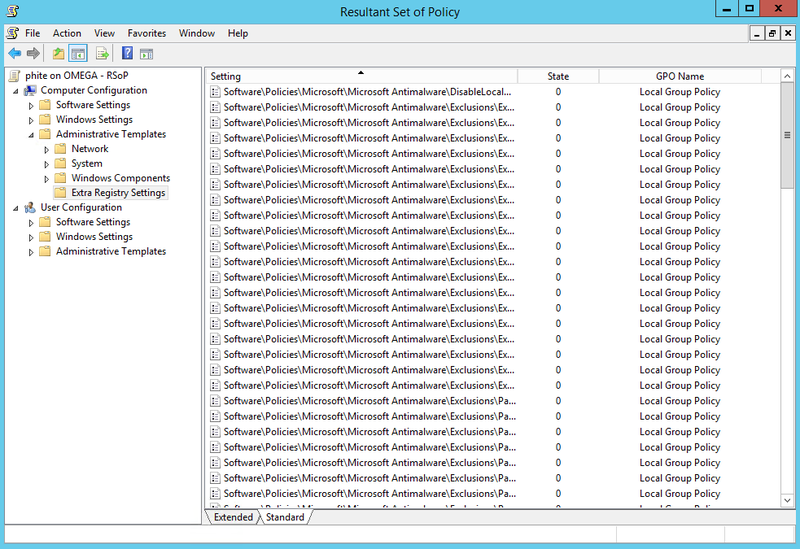 SCCM applies policies by using the client to inject registry settings via the local GPO, which SCEP then reads. If those policies are received by SCCM, but never make it in to the registry, then you'll get this behavior. 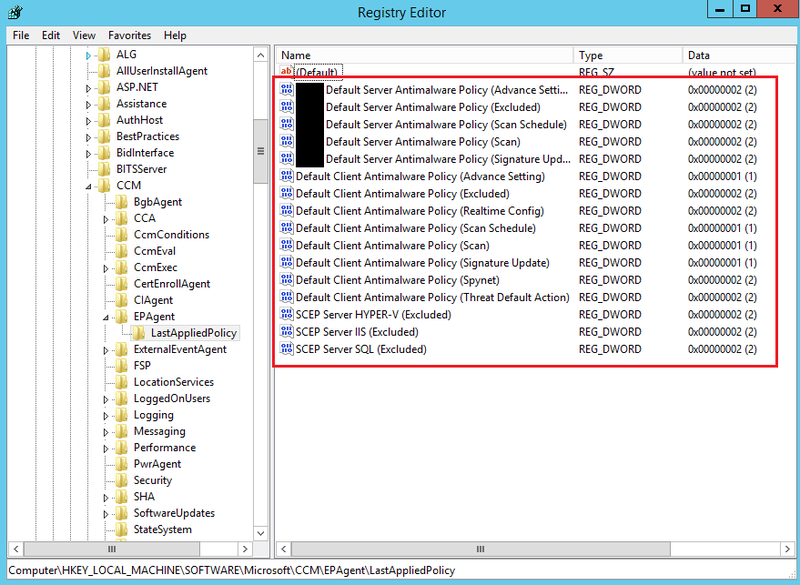 Run RSoP and check under Computer Configuration\Administrative Templates\Extra Registry Settings - You should see all of your SCEP policy settings here. Hopefully these tips will save you some of the headache of getting SCEP policies reliably deployed! I was racking my brain as to why the policies were applying but the setting were not. At one point I had the "Turn off Local Group Policy objects processing" setting applied, because of a local policy setting that was overriding a GPO setting. Turning off the local setting policy setting only saw it magically re-appear after a reboot. The local setting has since disappeared, however I still had this setting enabled in my GPO. After I disabled the recommended setting and changed a SCEP policy option, the settings applied. I've been analyzing your tips and I have not been able to come to a conclusion. My machines do not have the path Computer Configuration/Administrative Templates/System/Group Policy in the RSOP and others have, but still remain as unmanaged in the SCCM console. Do you have any other ideas of what it might be?